The Quiet Music of Gently Falling Snow by Jackie Morris. Illustrations Jackie Morris. Published by Graffeg, September 2016 £25. Copyright © Graffeg June 2017. 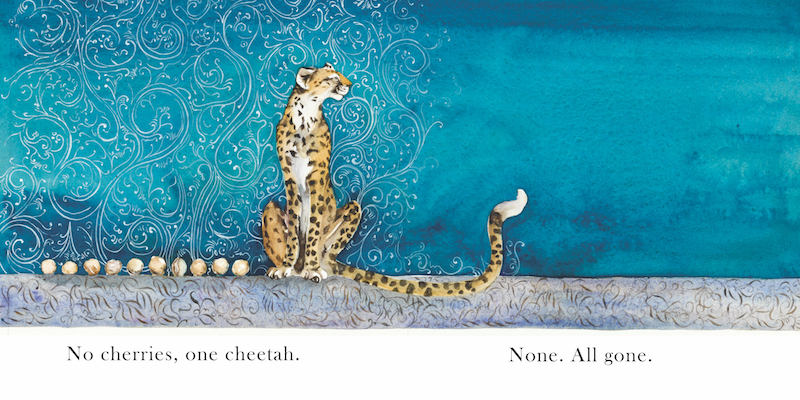 Text and illustrations © Jackie Morris 2016, from One Cheetah, One Cherry, A Book of Beautiful Numbers, published by Otter-Barry Books. Jackie Morris is an internationally best-selling author who lives in a small cottage on the Pembrokeshire coast. Originally from Birmingham, Jackie visited Pembrokeshire over 20 years ago for the weekend and never left. She shares her home with her two children, her beloved cats, and two dogs. The Quiet Music of Gently Falling Snow is collection of twelve illustrated folk tales, based around a series of musically-themed illustrations first created by Jackie for Help Musicians UK. The book was published in September 2016 by Graffeg. Jackie was shortlisted for the Kate Greenaway Medal in 2016. Her illustration of The Lost Words was recognised by UK booksellers who voted it the most beautiful in 2016.